This guide to the properties and applications of polyolefin composites consolidates information to help the reader compare, select, and integrate a material solution as needed. It covers polyolefin microcomposites, polyolefin nanocomposites, and advanced polyolefin nano and molecular composites and discusses processing, morphological characterization, crystallization, structure and properties, and performance evaluation at micro and nano structural levels. It details modeling and simulation, engineering performance properties, and applications. This is a practical, hands-on reference for practicing professionals as well as graduate students. DOMASIUS NWABUNMA is a research specialist at 3M with expertise in polymerprocessing. He holds three patents, has authored numerous well-cited journal papers,and has been a speaker at various conferences. He is a senior member of the Society of Plastics Engineers (SPE) and a member of the American Chemical Society (ACS) and the Polymer Processing Society (PPS). He has received many awards and honorsand has held many leadership positions. His most recent leadership post was as Presidentof the Upper Midwest (S22) Section of the Society of Plastics Engineers. THEIN KYU is a Distinguished Professor in the Department of Polymer Engineering at the University of Akron. He has written 180 refereed papers and book chapters, holds four patents, and coedited Liquid-Crystalline Polymer Systems, an ACS symposium book. 1. 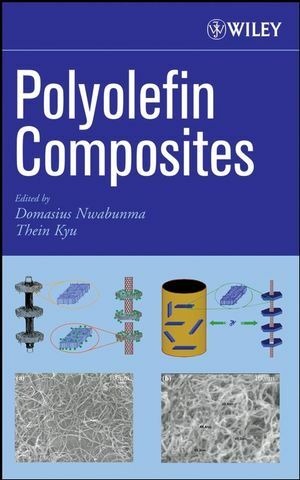 Overview of Polyolefin Composites (Domasius Nwabunma). 2. Polypropylene Natural Cellulosic Fiber Composites (Robert A. Shanks ). 3. Polyolefin/Natural Fiber Composites (Laly A. Pothan, Adriaan S. Luyt, and Sabu Thomas). 4. Composites and Nanocomposites of Polyolefins and Some Blends of Polyolefins/PA6 as Matrices and CaCO3, Wood Flour, Sisal Fiber, Hydroxiapatite and Montmorillonite as Fillers. (Carmen Albano and Rosestela Perera). 5. Ethylene Propylene Diene Rubber/Carbon Black Composites (Soney C. George and Sabu Thomas). 6. Selected Topics on Polypropylene/Wood Flour Composites: Thermal, Mechanical and Time Dependent Response (María M. Reboredo, Mirta. I. Aranguren, and Norma E. Marcovich). 7. Deformation and Fracture, Behavior of Natural Filler Reinforced Polypropylene (Celina Bernal). 8. Metallocene Catalyzed Functionalized Polyolefins in Composites (Ulla Hippi, Noora Ristolainen, Barbro Löfgren, and Jukka Seppälä). 9. Preparation and Properties of Polyethylene/Layered silicate (Yuan Hu, Hongdian Lu, and Lei Song). 10. Polypropylene/Clay Nanocomposites (Xuehong Lu, Ke Wang, and Yang Choo Chua). 11. Layered Double Hydroxide (LDH)-Polyolefin Nanocomposites. Preparation, Structure and Properties (José Ignacio Velasco). 12. Effect of NanoFillers on Crystallization, Phase Transformation and Thermo-Mechanical Behavior of Poly(1-butene) (Santosh D. Wanjale and Jyoti P. Jog). 13. Towards Polyethylene Nanocomposites with Controlled Properties (Yvonne A. Akpalu). 14. Fracture Behavior of Polyolefin-Silicate Nanocomposites (Sie Chin Tjong). Advanced Polyolefin Nano and Molecular Composites. 15. Polyolefin-Clay Nanocomposites: Theory and Simulation (Anna C. Balazs, Jozef Bicerano, and Valeriy V. Ginzburg). 16. Monte Carlo Modeling of Polyethylene Nanocomposites (Rahmi Ozisik, Peter J. Dionne, and Catalin R. Picu). 17. Characteristics of Multi-Wall Carbon Nanotube and Polyethylene Composites Prepared by Gelation/Crystallization from Solutions (Masaru Matsuo, Yuezhen Bin, Qingyun Chen, and Atsuko Yamanaka). 18. Crystallization Behavior of Polyethylene/Carbon Nanotube Composites (Lingyu Li, Bing Li, Steve L. Kodjie, and Christopher Y. Li). 19. Formation of Shish-kebab Structures in Ultra-high Molecular Weight Polyethylene/Polyethylene Composites Under Shear flow (Toshiji Kanaya, G. Matsuba and K. Nishida). 20. Template Crystallization of Ultrahigh Molecular Weight Polypropylene Induced by Chain Orientation of Co-crystallized Ultrahigh Molecular Weight Polyethylene (Rockliffe St. John Manley and Thein Kyu).